What are the costs for developing a music streaming app like Spotify? A music streaming platform Spotify came to the top within 10 years. Now it’s available in many countries of Europe, America, Australia etc. As the music app development, especially the development of the music streaming apps is growing, many businessmen are going to develop a music app and asking themselves why Spotify succeeded and how much they would spend if developing a similar application. You should realize that the development of a similar great music streaming platform is quite time-consuming and expensive process that requires unique solutions. 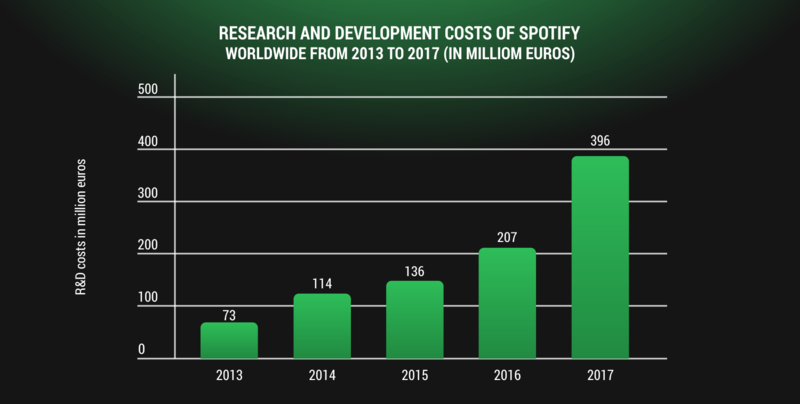 Look at the statistic of Spotify cost for development and research. Take into account that this project has paid back its expenses, for example, the Spotify premium revenue of the last reported year was about 3.67 billion euros. That’s why the efforеs are justified. Although Spotify offers its service in about 60 countries it’s still unavailable in the others. That’s why there is a great unmet demand, and business owners hurry up to come to the market with new ideas. But remember that copying Spotify's features is a bad idea. Talking about countries where Spotify is unavailable, these countries have already got alternative services. People are now looking for something new and wouldn’t enjoy the same old concept. You would succeed when building an interesting music streaming app with unique features. Do you know that Spotify provides its services in about 60 countries and this app gets about 50 millions subscribers? Have you already thought what features a similar app should have? Here are the core features of Spotify. Consider the option that your music streaming app should have similar features. Authorization helps to sign up/sign in with social media or an email. Music streaming service - listening to songs online using cloud storage. Notifications are for getting news from friends and the community. Search - the users can search the favourite songs by artists or titles. Playlists - ability to make playlists saving songs and albums. Offline mode - ability to listen to saved songs/albums offline. Sharing music - users like to share their choices with friends in social media. All above-mentioned features are free, but for monetization you’ll need to offer some cool features the users get with paid subscription only. Read the article How to monetize your mobile app: best choice for successful startups. Let’s move on to the technology stack for developing your own music app. When to talk about Spotify this app stores music on the servers and then it sends songs to the devices of the users. Then these songs are cached on laptops and smartphones and the users don’t have to pull them again. For this purpose, Spotify uses PostgreSQL, Cassandra and the memory caching system. CEF is a framework to embed Chromium-based browsers in other apps. The price depends on many factors. We are going to consider the main factors only and to explain what they are dependent on. Firstly, decide upon the development team. The cost will mostly depend on their hourly rate. Secondly, we should take into account all the components of the music app development. The app development itself would be the biggest piece of work. Besides, you would need to develop the backend, a desktop app, make a unique design and to test the music app. 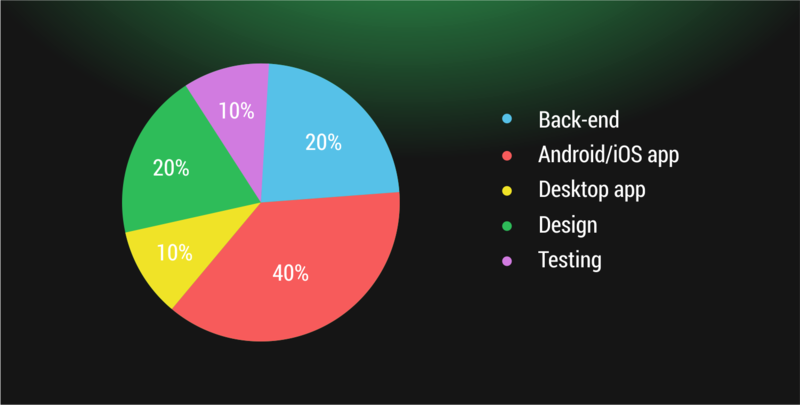 Look at this pie chart showing all the parts of the work. Bear in mind that such a development supposes a team of 8-10 skilled developers at least. Now let’s move on to the back-end of the music streaming app. The back-end development suggests approximately 200+ hours. Have a look at the backend of Spotify. For Mac/Windows client Spotify uses C++, Java is used for Android and Objective-C for iOS applications. Spotify back-end development uses so-called division based on features. This means a separate team of developers working on each feature. Additionally, Spotify uses many supplementary services, written in Java and Python, Clojure and HTML5 languages or PHP. Remember that you need to link the back-end with the front-end. This part of work would take a long time. 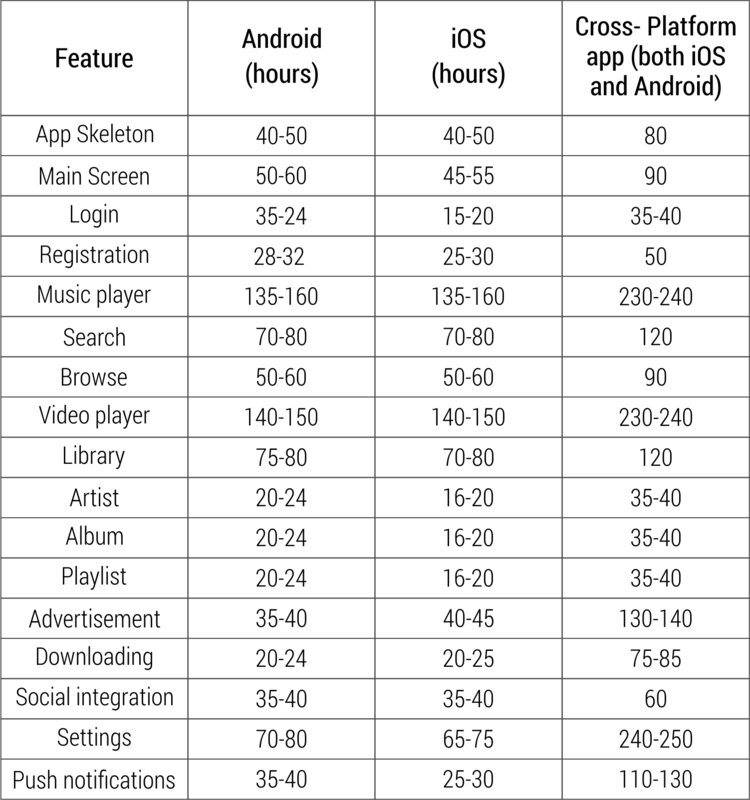 Here is a table showing how many hours approximately the developers would spend on which feature if it is developed for the native and cross-platform apps. Firstly, the code base for both platforms is the same. So, approximate costs for the native app development will be higher than those for the cross-platform mobile app development. Secondly, app development is much faster, therefore the product earlier comes to the market. You should remember that time in the table can differ and depend on the complexity and your own requirements for the future music app. Anyway, this part of work is expected to be quite time-consuming. The exact time can be decided only when you find the team and together with them set definite terms. Remember that you should invent additional unique features which are supposed to highlight your app and push it in front of the others. The development costs vary and depend on many factors, features but let’s take the approximate cost of $40 hourly rate for evaluating the music streaming app price. As it follows from the above, if developing native apps for iOS and Android, the price would start from $155.000 for both platforms. If you choose cross-platform development the average costs decline and would start from $125.000 and the app would be ready within a shorter period of time. All the mentioned costs are quite approximate and should be aligned with the development team. If we take as an example the design it would vary a lot depending on the clients’ desires. In this article, we considered the main costs for building the music streaming app like Spotify. As Spotify is unavailable in many countries there is a great unmet demand for the similar music application. When you start building the music streaming app you should take into account back-end costs, costs for developing on Android and iOS and costs for additional tools. And beyond that, create additional features which make your app unique because building the clone music app is not a good idea. Estimating the total cost we took the hourly rate of 40$ but these costs depend on the skills of developers and can vary. As the estimation of costs is very generalized, feel free to contact us if you want to accurately calculate costs for your music streaming app. Based on the success of Spotify, Pandora, iHeartRadio, SoundCloud, and TuneIn we gave some pieces of advice and described essential tips for beginning product owners.